In every movie about NYC worth its salt, there’s always some sort of iconic taxi scene. A farm girl from the Midwest learns to hail a taxi. An old lady elbows a Wall Street bro out of the way when he tries to steal her ride. Cue pan out and a hustle-bustle sort of music. But the yellow taxi—once up there with the Statue of Liberty and the Empire State Building for the poster child (vehicle?) of New York—has now become a token of the city’s demise, a bright yellow reminder of what happens when the gig economy swoops in an rewrites the rules for the laboring class. In the good old days, driving a taxi was a booming business. Taxi medallions—the little metal insignias that allow a car to operate legally as a cab—sold for $1 million dollars (a sign of both industry health and bloat) and thousands of drivers, many of them immigrants, saw taxi driving as an entree into the middle class. But with the rise of ride-hail apps like Uber and Lyft, who leverage their drivers independent contractor status to sidestep basic employee protections and regulations, the entire car-for-hire industry is in free-fall. And drivers on all sides are bracing for impact. The costs of Uber’s growth-at-all-costs model became clear last year when seven drivers—6 of of them cabbies or livery drivers, one of them from Uber—committed suicide over a combination of low wages, exploding debts, and the stress of chronic financial insecurity. One driver, Doug Schifter, was most explicit, posting a wrenching account of his struggles on Facebook before shooting himself on the steps of City Hall. Others, like Nicanor Ochisor, who hung himself in his family garage in Queens, didn’t point fingers directly, choosing instead to hide the shame of poverty in silence. Still others, like Fausto Luna—an Uber driver and the most recent to die—didn’t leave a manifesto but sparked drivers’ fury anyway; after Lunda jumped in front of an A train on 175th Street and Fort Washington Avenue station, his family and fellow drivers across the ride-hail spectrum gathered to mourn his death and demand stricter regulations. New York’s City Council responded with a bill placing a cap on Uber and all other ride-hail vehicles. They also passed legislation mandating a $17.22 minimum pay rate for drivers. (The current average is $14.25.) If the driver’s earnings fall below the threshold, their employers must make up the difference. The cap, the first of its kind in any American city, is designed to give the city time to investigate the industry and come up with additional solutions to the crisis, with everything from a partial bailout or hardship fund for indebted taxi drivers (many of whom bought medallions for $1 million years ago, only to see their value plummet to a mere $175K just as ridership took a nosedive) to “driver assistance centers” that provide mental health counseling and financial advice for floundering drivers. But the studies commissioned by the city show an industry that is truly out of control, as Silicon Valley execs reap profits and leave workers with the scraps. Uber alone runs 60,000 cars in the city—compared to the 13,587 taxi cab maximum allowed by the city—and rakes in $2 billion annually just in New York. In 2017, Uber rides surpassed taxi rides for the first time ever, logging 410,000 trips per day in February alone. But the colossal earnings don’t go to drivers, with the company withholding about $375 million in commissions and fees alone. This kind of markup is unusual even in the ever-more-rapacious world of on-demand delivery and gig economies. Amazon and eBay don’t even come close. Meanwhile, drivers are suffering, buckling under the weight of longer hours, unpaid debt, and dwindling ridership. The city’s recently commissioned study found that—contrary to Uber’s promises of making 5K in their first month—about 40 percent of on-demand drivers rely on Medicaid and 18 percent use food stamps. (The study didn’t cover yellow cab drivers.) Meanwhile, cabbies can’t afford their medallion payments, working twelve-hour days but seeing less money than ever before. The problem is dire, especially considering how quickly—and how thoroughly—ride-hail apps have woven themselves into the city fabric. With a new base of consumers used to rock-bottom prices and immediate service, it will be hard to shift to policies that favor workers. But cities are trying, anyway. Seattle recently passed legislation allowing ride-hail drivers to unionize, but is facing mounting legal challenges. Meanwhile Honolulu’s mayor outlawed price surging, and London rescinded Uber’s license until the gig giant agreed to stricter laws and government regulation. New York’s ability to pass a license cap and minimum wage for drivers is a huge step forward and shows that public opinion—or perhaps the app industry’s power—is shifting. (Mayor De Blasio's earlier attempts to cap Uber licenses resulted in a bruising defeat.) But the apps aren’t going anywhere without a fight, and they recognize how much power they already have. In negotiations over a license cap, for example, Lyft said it would support a tech-funded $100 million hardship account for drivers, but only if the city dropped its bill. It’s up to cities like New York to reign in the titans of the gig economy, showing them that they mean business about whether or not the apps can do business. 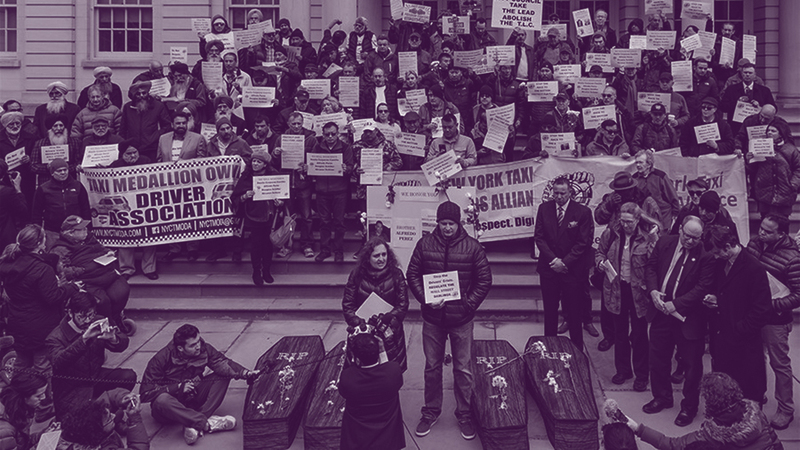 If they act, they could relieve thousands of workers—cabbies and ride-share drivers alike—of a nearly unbearable burden of debt, stress and depression. They could even save lives. If they don’t, more suicides will likely follow, as drivers slide into ever-increasing debt, the next iconic New York movie will have to be more honest: a tech bro elbowing a worker to the ground while the city skyline looms.